This is a gorgeous, fresh tasting green risotto and is easy to make as it is baked in the oven. The Cutrer Chardonnay would be delicious with this spring dish. Preheat the oven to 350°F. On the stove top, heat half the olive oil in a deep ovenproof saucepan, add the peas, spinach and 1 cup or so of stock and cook stirring until the spinach wilts, about 2 minutes. Carefully puree the mixture in a blender or food processor and set aside. In the same saucepan, heat the remaining olive oil, add the onion and garlic and season with salt and pepper. Cover with a lid and sweat over a gentle heat until soft but not browned. Add the rice and stir it around in the saucepan for a minute, then add the wine and cook stirring until it is absorbed. Add the remaining stock, stir and bring it up to the boil, cover with the lid and place in the preheated oven for 15-20 minutes or until the rice is just cooked and all the liquid has been absorbed. Stir in the vegetable puree and set aside with the lid on. Meanwhile, bring a saucepan of water to the boil, add a good pinch of salt and the asparagus. Boil for 2-3 minutes or until it is just tender, then drain and immediately plunge into cold water to preserve color and texture. 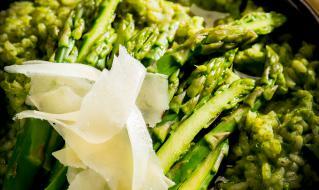 Serve the risotto in warm bowls with the asparagus and pecorino arranged attractively on top.